Five waterfront cottages and a 3-bedroom hilltop site are offered to guests at Barefoot’s Resort. Ten wooded campsites for recreational vehicles are available separately on the grounds. Many patrons return year after year for the quiet hospitality and natural environment. Come and experience a balance of privacy and proximity to other vacationers who value a simpler, slower-paced time near the water. 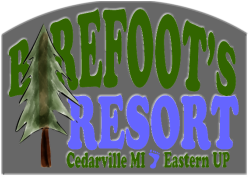 If you're looking for the affordable authenticity of a classic Michigan vacation, we still make possible that unique and memorable experience.